Recently I’ve become disenchanted with basically all of the guilds I’m in in all of my games. I’m not sure if it’s the cause or the effect of the burnt out feeling I talked about last time, but either way it’s there. Surprisingly, there’s no drama happening in any of them, and they’re all for slightly different reasons (even the different divisions of the multi-game guild I’m a part of). For some games, I just don’t feel like I fit in anymore, for some I feel like the guild grew so much that I’ve gotten lost in the crowd, and one in particular had just decided it was time for us all to go our separate ways. 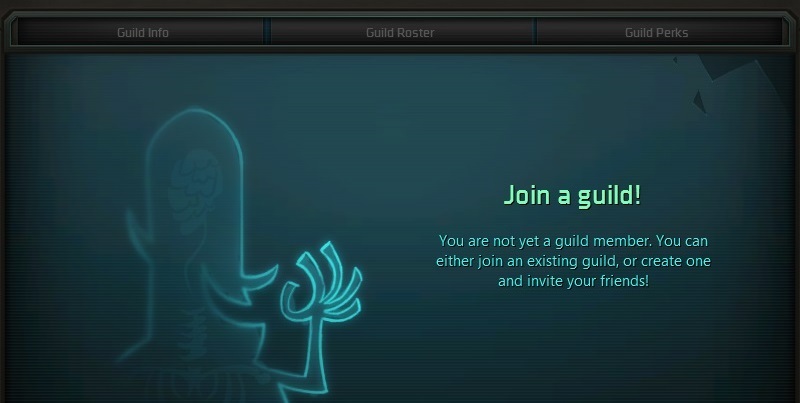 This has me a little frustrated, since I hate trying to find a good guild, and the idea of doing it in a bunch of games makes me not want to play those games. As I see it, other than spamming zone chat, I have three options, none of which seem terribly appealing. The most obvious first stop is the forums. Here, there are tons of guilds vying for my attention, with descriptions and sales pitches and raid times as far as the eye can see. But how do I pick? Everyone seems to market themselves as “a friendly, community oriented medium-casual guild,” many with raid/dungeon nights in my time zone. I guess I pick one with a name that I like and see if I feel like I fit in? Currently, I’m in a guild that has divisions in Guild Wars 2, Star Wars: The Old Republic, Elder Scrolls Online, and, until recently, WildStar. This is great because it means that I don’t have to go guild shopping in every game I go to; it’s just there waiting for me. If I don’t think I’m going to play a game for a while, I don’t feel like I have to notify anyone or leave the guild, because I’m still technically active within the guild, I’m just spending more time in a different division right now. And yet, I haven’t really done anything with them in ages. They’re a great bunch of people, but recently they’ve gotten so big that I feel like I get lost in the crowd, especially when jumping from game to game. The final option is to start my own guild. Running a guild means I get to set the standards for the kind of community I want, I get to decide the rules (though “try to keep it PG-13 or less and, in general, just don’t be a jerk” about sums it up), and I get to set the tone for how serious we are about the game. It also means I have to deal with people when they want to cause drama. I’ve toyed with this idea for a few months now, but the problem is that, in that time, I haven’t really played just one MMO consistently; I’ve played a bunch of games a little bit. If I’m going to be a guild leader, I’m going to want to be in my guild’s game at least three or four nights of the week for a few hours, and I’m not sure I want to make that kind of commitment to any one game at this point. However, if I did, it would probably be Guild Wars 2, since that’s the game that I feel the most knowledgeable about (despite having never seen the inside of a raid, even in a video), and have the most leveled and geared characters. It’s also the game where I have the most friends playing at the moment (though most of them are even more casual players than I am, so they probably wouldn’t be the best foundation for a new community, but at least I would have a few members to pad numbers with). Maybe it’s because I’m such an introvert, but I hate shopping for a good guild. If anyone has any recommendations for guilds active in the US Eastern time zone for Guild Wars 2, WildStar, or Rift, go ahead and leave a link in the comments. I won’t guarantee that I’ll join, but I’m willing to take a look. Or let me know if you’d be interested joining a potential Occasional Hero Guild Wars 2 guild (just kidding… mostly).